As a specialist consultant with extensive experience in SAP ERP implementation projects, I constantly face challenges in desing Gaps or complex solutions that clearly require knowledge of integration between SAP ERP modules. 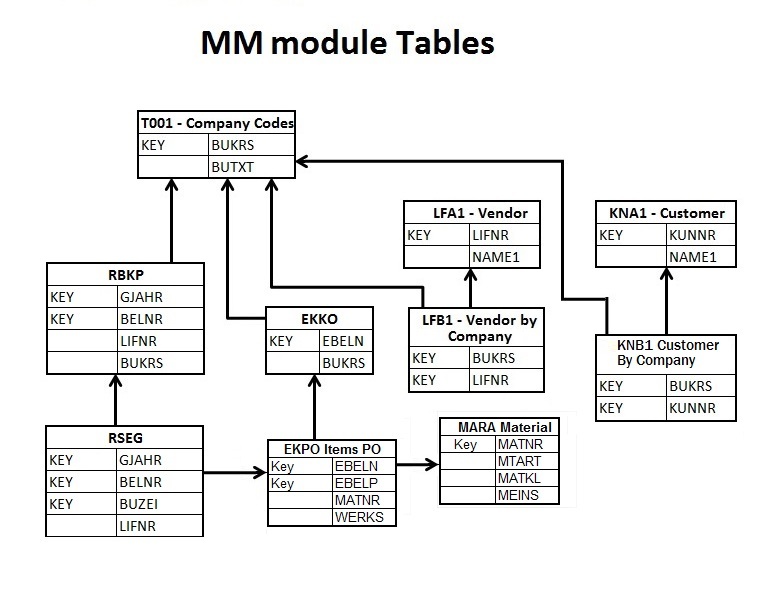 In this short article I will elaborate something containing knowledge about the connection between two system modules, FI (finances) and MM (materials) based on the respective relationship of their tables (Data Model) of the corresponding database. Large deployment projects or even improvements maintain the figure of the “solution architect” (or integration consultant) who is a professional who holds a more comprehensive view and integration of the system as a whole. In these complex projects the figure of this professional is fundamental, because he is the one who acts in order to impose his technical and business experience to the benefit of the team and the best SAP practices, in order to create solutions that achieve satisfactory and technically adequate results of the point of view and assertiveness. To specify application or program developments within SAP FI and MM, you need to know your structure well. 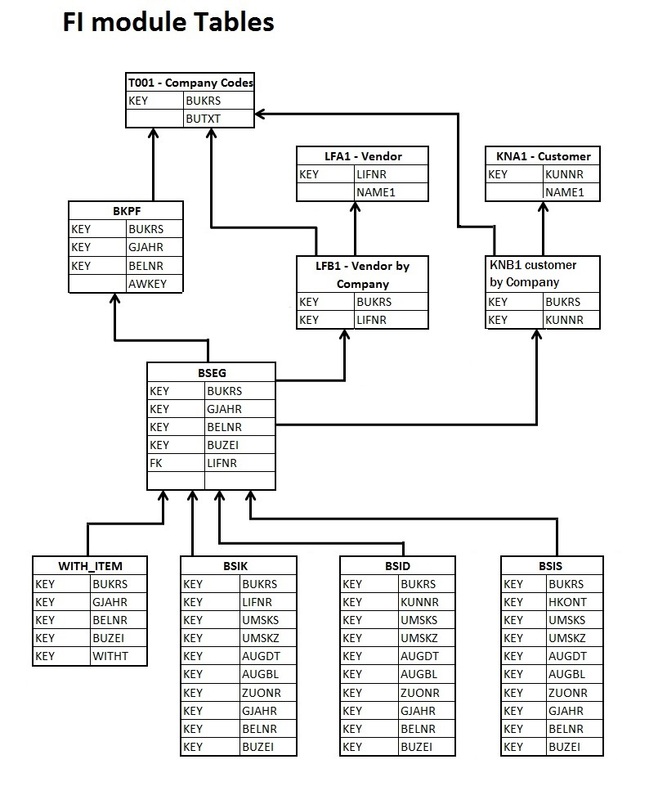 The following figure shows a data model with the relationship of the main tables of the FI Module. Obviously not included in these picture all the tables and not all their respective fields, but only the necessary tables were shown to open the understanding of the whole, that is, those that directly involve relationship. 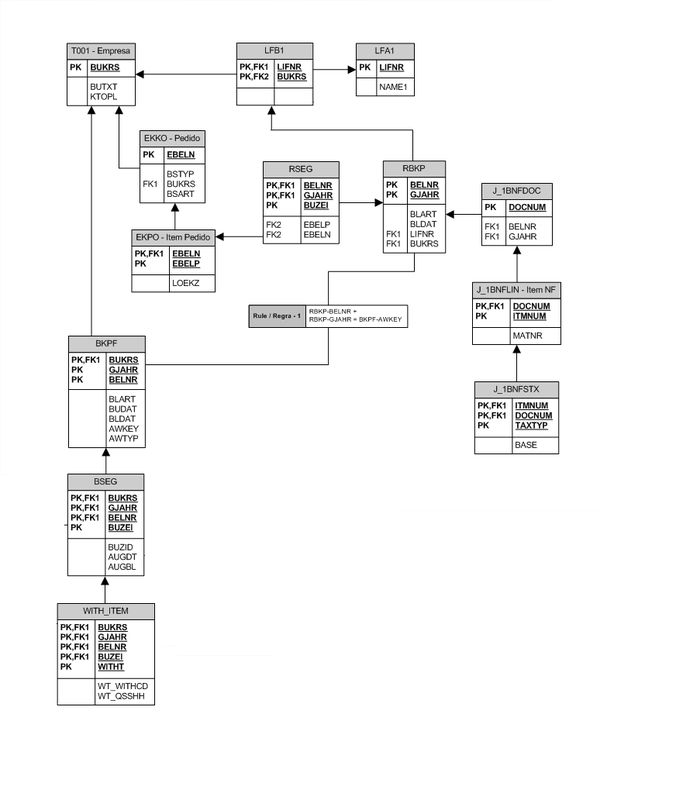 Therefore, this material is directed directly to the professionals involved in the development (SAP Functional Consultant and Abap Consultant), who are planning or developing solutions in the SAP ERP system that involves these two modules (MM and FI) and who must definitely understand how the relationship between these modules. RBKP-BELNR + RBKP-GJAHR = BKPF-AWKEY. That is, the concatenated contents of the document number (RBKP-BELNR) and the exercise (RBKP-GJAHR) will be recorded in the BKPF-AWKEY field. Feel free to contribute something if you wish.